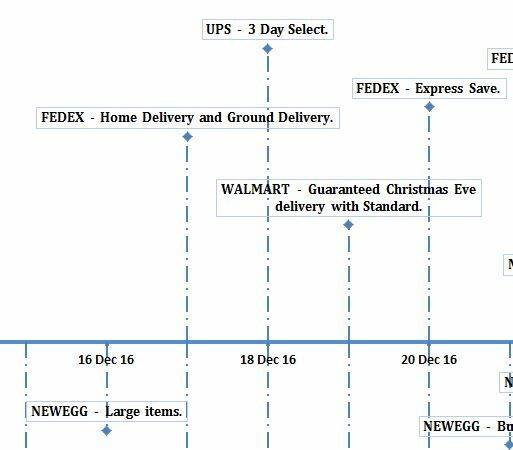 The Year-End Shipping Deadlines template is a tool designed to help you track your holiday shipping this year. Not only will you receive a comprehensive list of all the most popular shipping carriers and their policies for the holiday season but you’ll also gain a way to track all this data on a convenient timeline. The visual combined with the ease in which you’ll be able to enter your shipping items makes for one powerful experience. Whether you’re a small business looking to organize your shipping for large quantity sales or you simply have a large family, this template has the tools you need to get your packages where they need to be for the holidays. To download the free Year-End Shipping Deadlines template, just follow the link at the bottom of this page. Start in the “data chart” tab at the bottom of the template and enter the shipping carrier you want to use. The template gives you a helpful list of examples with all the biggest names in the market. The next step is to enter the date in the second column of the table. The template will then show you the day of the week your shipment will fall on. Each store on the list also has their own options for your preferred shipment method. Enter the one you chose for your specific item. If you go to the “Chart” tab at the bottom of your screen, you will see a timeline of all your shipping items. The carrier and the shipping option will appear in the order that your shipments will arrive. You can use the last column in the previous tab to change the height of the item on this timeline as well. This template gives you the power to track your items effectively this year!